﻿﻿PAEE partners with the Allegheny Land Trust to organize workshops for classroom teachers and non-formal educators to deliver Project WET, an award-winning water education program that promotes awareness of water and empowers community action to solve complex water issues. Contact Jessica Kester, PA Project WET coordinator, if you have questions or want more information. Developed specifically for teachers working with young children (ages 3-6) and in coordination with early childhood experts and educators, Getting Little Feet WET is Project WET’s early childhood curriculum. Getting Little Feet WET contains 11 interactive, hands-on activities for young learners to explore different aspects of water—from water properties to water sounds. Each activity offers both Pre-K and K-2 options and is correlated to respective educational standards. The day will includes hands-on practice with all of the Getting Little Feet WET activities as well as early childhood (K-2nd) activities from the Project WET 2.0 curriculum guide and online resources from the Project WET Educator Portal and DiscoverWater.org. This is a Facilitator level Project WET workshop designed to increase your ability to teach about water and its connection with our daily lives. After completion of the course individuals will be certified to teach Project WET 2.0 and Getting Little Feet WET curriculum. Upon completion of the homework, individuals will be certified to facilitate workshops for other teachers in the Project WET family of curricula. There is only one facilitator level workshop held each year for formal, pre-service and non-formal educators in the state and this is it! This is also a wonderful, hands-on way to upgrade from the old "white" WET 1.0 guide to the new "blue" 2.0 guide while specializing in early childhood applications. Registration fee includes: Project WET 2.0 Curriculum & Activity Guide, Getting Little Feet WET Curriculum Guide, Water We Signing About CD and completion certificates for both Project WET 2.0 and Getting Little Feet WET. 6 PAKeys hours and 7 ACT 48 hours available as needed. Meals are not included in the registration fee. Participants can bring a bagged lunch or eat in the hotel restaurant. 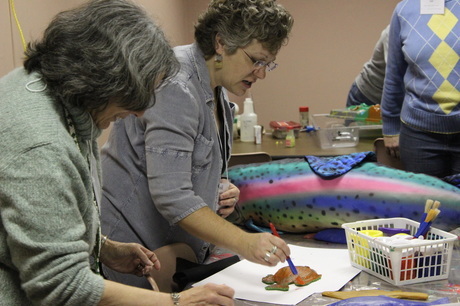 Learn how to bring Project WET activities into your classroom at these workshops for teachers. Become a facilitator and learn to train classroom teachers to deliver Project WET activities and curriculum. Project WET's award-winning curriculum resources help educators teach complex environmental issues.